Greetings, and welcome to my second TAS submission - B.O.B. on the Genesis. All previous attempts at this game have been awful to watch, so I thought I'd take it upon myself to make a much better movie than was attempted before. This is a 5 minute, 10 second, 33 frames (18633 frames) improvement over the rejected run submitted by Mvpetri. Both this run and the no-damage run by windeu have helped with route planning and the use of REMOs. You play as B.O.B., a cool dude robot who is on his way to a date with a bodacious babe. 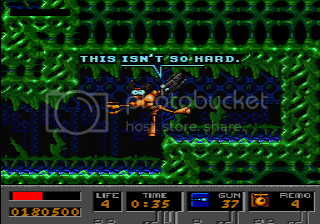 Unfortunately, you manage to total your space car, and crash land on to a hostile planet full of gnarly robots and heinous aliens. Blast, spring and fly your way to your dream girl! B.O.B. runs at a maximum speed of 592, and gains the most acceleration while jumping. This is why I immediately jump at the start of a stage, and after long falls. Crawling into tight spaces allows for a maximum speed of 288. Falling immediately after crawling preserves this speed until you land, and then you can accelerate normally while standing or jump to gain faster acceleration, up to the normal limit of 592. The spring creates a platform that springs you up into the air, until you reach a certain height or you hit a ceiling, when you start to fall. Springs can be used multiple times in quick succession in order to gain a lot of height. It can also be used to protect B.O.B. from a massive fall, since falling momentum is reset once a spring is used. Maximum speed gained from the spring is 1344, and interestingly holding C near the top of the jump can gain a little extra height. Near the top of a jump, vertical speed reduces normally at a rate of 200 per frame, but by holding C this is reduced to 100 per frame. This can be used to gain a little extra height. However, using a second or subsequent spring before a certain height can maintain the maximum speed much further. A helicopter hat is generated above B.O.B., giving him the ability to fly. He can move in all eight directions with the helicopter active, although landing early automatically ends the helicopter. After a certain amount of time, it runs out naturally. While using the helicopter, B.O.B. can move left and right at his normal maximum speed (592), but accelerates as slowly as walking. However, his vertical speed is only 768, which makes it worse than the spring in a lot of places. Where the helicopter is most useful is when there is a long vertical area since a single Heli REMO can cover more distance than a single spring, and where you need to travel around various obstacles or otherwise move in multiple directions. B.O.B. can get his Rihanna on with this orange fashion item. It allows for a slow fall, and can prevent him from landing hard and doing the splits, or just being stunned from a medium fall. If used at a certain height before hitting the ground, the spring, helicopter and umbrella REMOs can allow B.O.B. to coast forward at full speed while the REMO animation takes effect, gaining a bit more distance left or right before the REMO is used. The shield prevents damage while active. It is used in a few places on the later levels since I take a lot of damage. While the shield is active, the helicopter, umbrella and lightbulb REMO cannot be used, but springs can. The other REMOs - a timed explosive and a lightbulb which causes enemies to freeze in place - are not used since it does not aid in completion. No self-respecting robot flies through space without being armed, and B.O.B. can gain several different sorts of ammo for his multi-use gun. Your basic starting ammo, this is low powered and is generally ok for picking off weak enemies. Sees some use in the early game, but quickly becomes useless. Not only does this have triple the strength of the single shot, but it also fires in 3 directions. This is perhaps the most versatile ammo, and I use this the most throughout this run. Once it hits a target, strangely, all 3 shots disappear from the screen even if only one of the 3 shots hit something. In the SNES version, each shot works independently. Toasty! The flamethrower eats through ammo like nothing, but it can do a lot of damage over time. I demonstrate its use in a few places through the run, but I use it on some bosses since it is a good damage weapon. These homing rockets aim towards an enemy once they are fired. Good for places where you cannot jump to reach high enemies, but a bit weaker than the Triple shot. Still, they are not without their uses. B.O.B. harnesses strong electrical power which, like the flamethrower, does damage over time. This is the second most powerful ammo, but is also not easy to obtain without going out of the way. I only collect 2 Lightning shot packs (10 shots each) in this run. The most powerful weapon, the wave shot produces a huge wave that decimates enemies. It does twice as much damage over time as the Lightning shot, and I save many of these in order to beat bosses quickly. Ammo comes in packs of 3 however, so they are rare and precious. In certain stages, B.O.B. gets to pilot a jetship around a maze of sorts. This fast vehicle can speed left and right at a dazzling 1536, and up and down at a speed of 1280. Although these stages look like a maze, most of the detours are dead ends, and there is generally only one path you can follow to complete the stage. By jumping alongside the corners of ledges and platforms, B.O.B. can gain a slight boost. This could translate from a few pixels to a whole 2 frames. The jetship stages also feature corner boosting, and I try and take advantage of this property in all places where I will gain time. mmbossman: I don't think that this game makes a very good choice for a TAS, but the response for this version has been positive, and the SNES version is very lowly rated in both technical and entertainment categories. So, I think this submission should obsolete our currently published movie, despite being for a different platform.